Our product range includes a wide range of rock drill bits. We are the manufacturers and suppliers of Rock Drill Bits. Our Rock Drilling Bits are manufactured using High grade alloy steels Tungsten Carbide and are designed to perform well. Further, we ensure to satisfy the entire requirements of our clients in all possible manners. The offered products are available in market in various sizes and specifications. 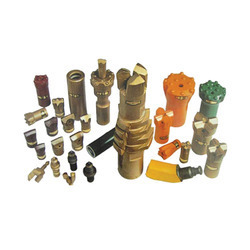 Our range of Rock Drilling Bits Varies from 2.5 " to 12 " inch and are suited to all popular Brands of bit DTH Hammers that are available in the market. Further, our products are demanded all across the world due to their outstanding performance and long functional life. One can avail these products from us in bulk. Looking for Rock Drill Bits ?